Exiled dictator Jean-Claude Duvalier, the notorious Haitian dictator known as "Baby Doc," ended his 25-year exile earlier this week. He returned to Haiti, where he's facing charges. I was too young to remember, or simply too young to be interested. Yet, having lived in South Florida, two names are all too familiar. Cubans in South Florida complain about Fidel Castro and Haitians, about "Baby Doc." So when 60 Minutes shared this 1986 piece on the ouster of Jean-Claude Duvalier, by the now deceased, Ed Bradley, I was curious. 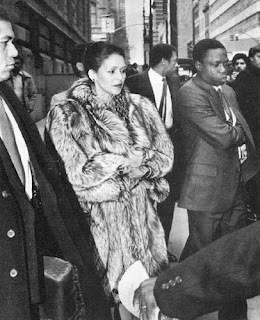 Here's the stunning story of how Duvalier's then wife, Michele's shopping spree caused a revolution, forcing them to flee Haiti over quarter century ago. I'm not surprised that they have no problem with Mr. Devalier, but have instead chosen to demonize their "First Lady". It's interesting, no matter where you go in the colonial world, when an evil is committed, the blame is consistently placed on the woman (no matter whether deserved or not). From Napoleon (who supposedly only re-instituted slavery because of the evil encouragement of his wife - to Imelda Marcos, the wife of a Filipino dictator whose penchant for shoes was apparently the reason for the downfall of a political family - to Haiti, whose former First Lady is blamed as the evil behind a dictator for life (whether or not we support the idea of a dictator) and accused of being everything from a lesbian to the son of God - no matter where you go in the colonial world, you see those who reside in those countries were have truly learned well from their European colonizers. The idea of women equal - sin, evil, blame, etc. is a European idea. But throughout the colonial world, even Haiti, you see that those who were subjogated by the European colonies have indeed embraced those same foreign, sexist ideals.